I’m very happy to announce that Dustfall 3 – The Baying of Wolves – is now live! A new and unexpected environmental threat has emerged, unleashing hordes of the primitive tunnel dwellers known as the Valk. Jonah must find a way to keep the Elk safe from new enemies while trying to outrun the Cygoa in a land of dwindling resources and constant death. From bestselling authors J. Thorn and Glynn James comes Dustfall, a new post-apocalyptic series chronicling one man’s challenge and his epic quest to save what remains of humanity. Dustfall 1 is now available as an audiobook (on audible) from Podium Publishing. In a ravaged tribe on the edge of humanity, the suspicious death of a chief thrusts a man into a dark realm for which he is unprepared. When Jonah inherits leadership of the Elk Clan from his father, many in the old man’s inner circle question his son’s ability to lead the tribe to their winter shelter at the ruins of Eliz. A dark stranger, a journey over hundreds of miles of dangerous highway and clashes with feral gangs will push Jonah to the edge. I’ve had a lot of folks ask if I’ve abandoned some stories that are currently unfinished, such as Diary of the Displaced, Thrown Away, Last to Fall, etc. For the record. Arisen is the only series I no longer write – Michael Stephen Fuchs is finishing that. I’ve been busy with Dustfall 3, and because it’s co-written I have an obligation to keep up with J.Thorn on that. So it’s taken priority and other projects are delayed (some of them by quite a bit of time! Sorry!). NONE of the other series are abandoned. They will all be finished. I also have ideas for a new projects – far too many ideas – but will hold off on starting them until I finish some of the current ones. That’s my problem, see. Too many ideas demanding to be written. Thrown Away episodes 6-8 are finished in draft but need editing – then it’s done. It’s possible I may write other tales in that setting, but I’m not going to promise on that. Last To Fall 2 is half-written in draft. There will be 4 novellas in that series, so 3 more to come. You can read more about it on our blog. Diary of the Displaced 5 is partly written, in draft. Each book in that series comes as it does, when it chooses to, and I have a feeling the story is not even close to being finished. You’ll get a new one soon, but there’s no point asking when that tale will come to an end because I’ve no clue! It could be book 6, or it could be book 25. Who knows? I won’t until the end presents itself. Dustfall, Book Two – The Parting of Ways – Available now! When Gaston splits the tribe and convinces Seren to join him, Jonah must lead the remaining Elk despite the constant threats on the road to Eliz. But all is not what it seems in the land of the winter ruins. Invaders from the north have secretly traveled south as well, forcing Jonah to risk everything to save his clan and his family. Co-written with J.Thorn. Dustfall is a new post-apocalyptic series chronicling one man’s challenge and his epic quest to save what remains of humanity. In a ravaged tribe on the edge of humanity, the suspicious death of a chief thrusts a man into a dark realm for which he is unprepared. When Jonah inherits leadership of the Elk Clan from his father, many in the old man’s inner circle question his son’s ability to lead the tribe to their winter shelter at the ruins of Eliz. A dark stranger, a journey over hundreds of miles of dangerous highway and clashes with feral gangs will push Jonah to the edge. 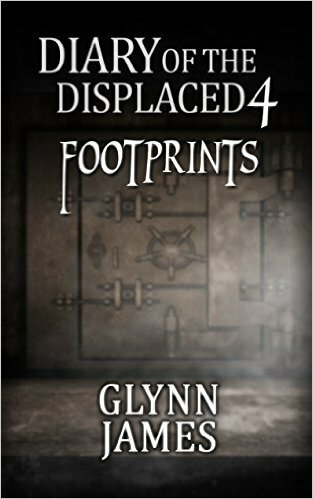 Diary of the Displaced – Book 4 – “Footprints” is out! It’s been a long time since I visited this series, and I’m grateful to those of you who have been very patient. Finally it’s here! Connor Halldon believed what he had been told as a child. His mother had died in combat on a distant world. Until he finds an old message that had been left for him on the same day that she had fallen in combat. Now he doesn’t know what to believe. Has his whole life since that day been based on lies? Was his mother even dead? Now, the Resistance soldiers are hunting him down, and he doesn’t even know why. All he can do is follow the trail left for him. The Arisen Omnibus 2 is now available! We’ve compiled books 4-6 in a second omnibus, now available from Amazon! This won’t be released in paperback, only on kindle – the thing is just too big!